Last year, a Clorox IT team was visiting a service partner in Chennai, India, on March 8, International Women’s Day. 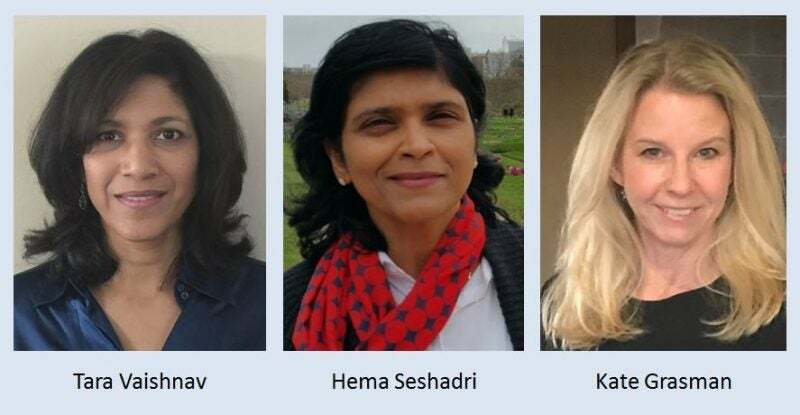 The Clorox team included three women, Hema Seshadri, senior manager – IT, among them. Hema’s a proud member of the leadership team of SHOW, the Clorox women’s employee resource group. Here’s her report on the day. Some of the female leaders in Clorox’s IT function. We happened to be in Chennai, India, on International Women’s day, and it was quite an experience! From the moment we got out of the car and all day long, we were welcomed with choruses of “Happy Women’s Day!” This was obviously a special day in India, and men and women equally wished us well. We joined an event where we were presented with a beautiful bouquet of flowers and asked to speak to a group about our experiences as working women in the U.S. and balancing work and motherhood in the demanding tech industry. First off, the sheer numbers of women in tech, both in Bangalore (which we visited earlier in the trip) and Chennai was amazing. As someone born in India and faced with stiff opposition to women in tech 20 years ago, it was unbelievable to me to see such a transformation. Yet many of the working women I spoke with faced the same challenges as we face in the U.S. We connected over our shared stories. Kate Grasman, vice president – Performance Management, spoke about unintended and intended bias she has faced in the workplace, some of it based on her appearance and not looking like your stereotypical tech exec. Tara Vaishnav, vice president – Digital Technology Innovation and Advanced Analytics, discussed unintentional bias from family members as well as finding support within her family from her husband and in-laws. During the event, we also talked about Clorox culture and how supportive our leadership is of women in tech. Half of Chief Information Officer Jay McNulty’s direct reports are women. And women are well represented on the IT leadership team — a fact the audience loved. All three of us Clorox women talked about how the support we receive at Clorox enables us to have our cake and eat it too — for the most part. Yes, we work long hours and make ourselves available any time of day. But we also enjoy flexible schedules, the ability to work from home if required and a feeling of belonging, which is what Clorox Inclusion & Diversity efforts emphasize. We enjoyed a robust discussion around ways to help make similar changes happen in Chennai so our partners could enjoy a similar culture to ours at Clorox. At last word, our partner company had already worked out more flexible commuting options by setting up smaller, satellite campuses and more telecommuting options. I hear they are changing slowly but surely. We ended the meeting by asking the many men in the audience to promise they would do their best to support the women in their lives. At that moment at least, their sincerity was clear. India is considered a developing country, and there have been plenty of news stories in recent years about women being treated badly there. But what we encountered in this small part of Chennai was very encouraging. It was also a wonderful opportunity to share with women halfway across the world how Clorox provides its tech employees good work-life balance and a culture of inclusion. One year later, as we again celebrate International Women’s Day, my thoughts are with the amazing people I met in Bangalore and Chennai and all the ways that business opportunities can lead to progress for women around the world.